Words & Wool | Where I write about knitting. Where I write about knitting. I had cast on for the little cardigan on September first. I made it a goal to finish by the end of the month and I did! I finished the second sleeve, weaved in the last ends, and sewed on the buttons all before midnight last night. Corinne tried it one this morning and was so thrilled. It looks adorable on her! Notes: Simple, well-written, lovely pattern. I think I’ll make another of these! I love the little cable twists. 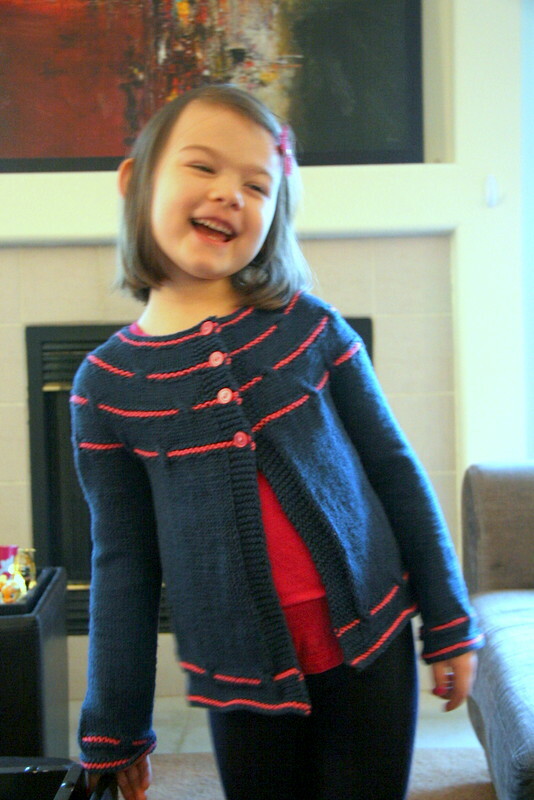 I knit the size 6 for Corinne (age 5) and it fits very well. I had to increase the sleeve to approximately 14.5 total inches, but I didn’t make any other modifications. 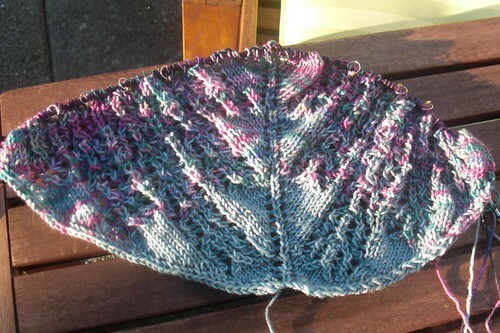 I’ve made a lot of progress on Corinne’s little cardigan. I started the first sleeve today. I’m really excited to see how this one looks once it’s all finished. Corinne was excited to try it on when I checked the length. I will say, a size 6 kid’s cardigans sure do take longer than size 6 month! Are you finishing anything up right now? Please leave a comment and tell me about it. My little girl started kindergarten this week and I had hoped that would give me more time for crafts. So far, after two days of (half day) kindergarten, I’ve gotten a bit further on the little cardigan I’m knitting for her and I’m hoping to make more progress this weekend. Today, however, needed to be a sewing day. Some good friends welcomed their new baby girl into the world two weeks ago. Later today we get to meet her and I had wanted to make something special for the baby. 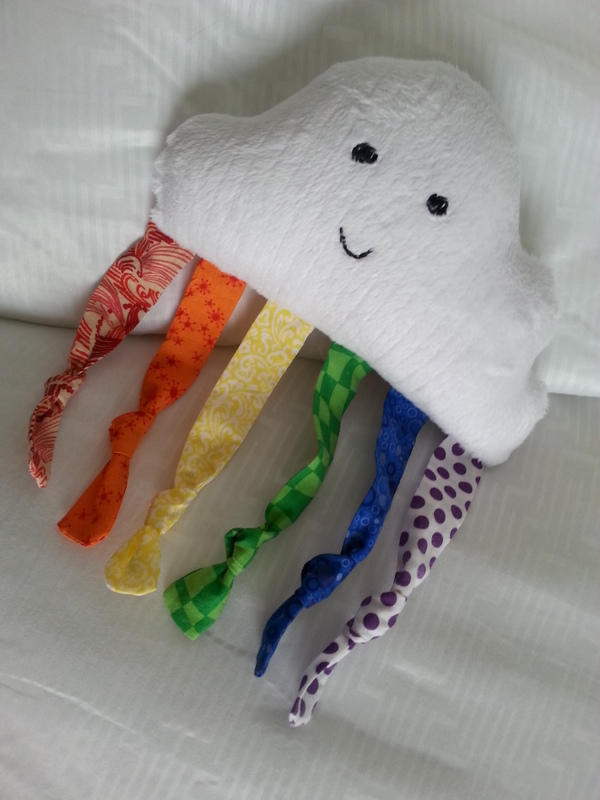 I had pinned a tutorial for a cloud/rainbow toy ages ago and decided it was the perfect gift for the new baby. I had picked out the fabric (soft, silky minky for the cloud, fun geometrics for the rainbow), printed the pattern, and was ready to go for weeks now. But I’ve been dragging my feet because of the embroidery…two little black eyes and a small smile and I was avoiding a project simply because of that! So, today, with a few hours to go before we go see the baby, I buckled down and embroidered, sewed, and stuffed. Tap tap tap…hello? Anyone out there still? So, um, yeah. It’s been over three years (almost four!) since I last posted. What happened? 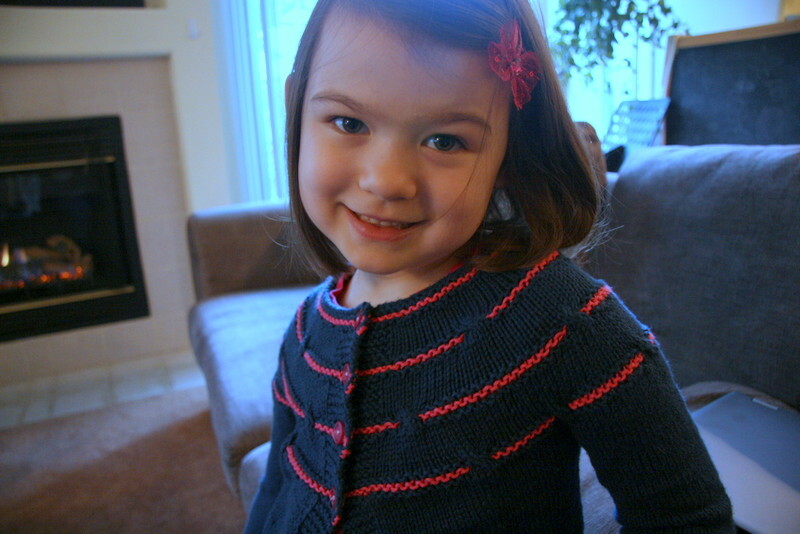 my daughter has been busy growing into a lovely, amazing, smarty pants, funny 5 year old. my hobbies have expanded to include sewing and euro board games. 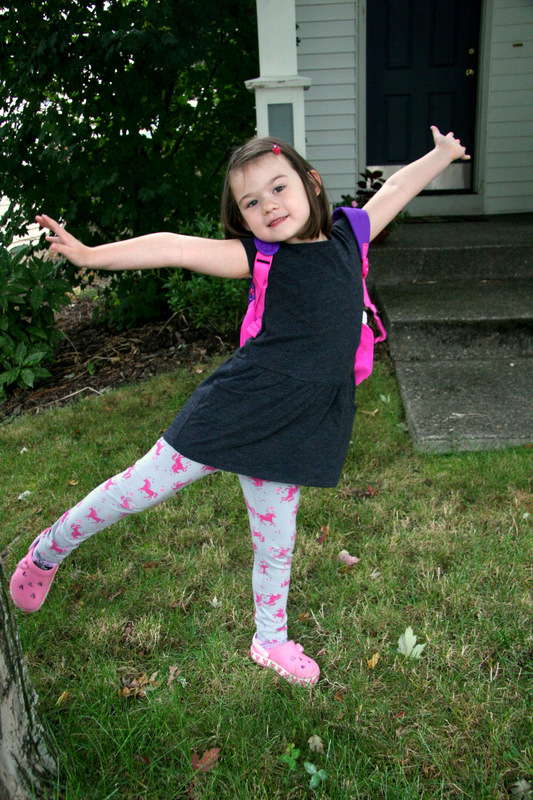 we have three cats and a puppy, but only one of the cats is original to the year 2010.
we still live in Oregon and I’m starting to feel I can take time again to blog now that my daughter is starting kindergarten….tomorrow! 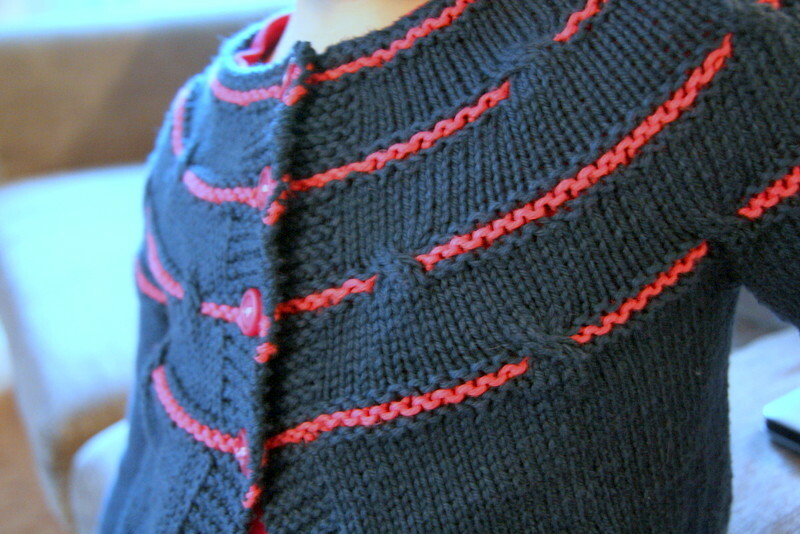 As for knitting…I have been knitting fairly steadily since I last blogged up until about 6 months ago. Then I stopped. I don’t know why. WIPs were draped around the living room. Patterns were still being queued occasionally on Ravelry. A random skein of yarn (or two or three) arrived in my mailbox. Then, a couple nights ago, I started knitting again. This the Bella cardigan and I’m using KnitPicks Comfy Sport in Planetarium and Zinnia. 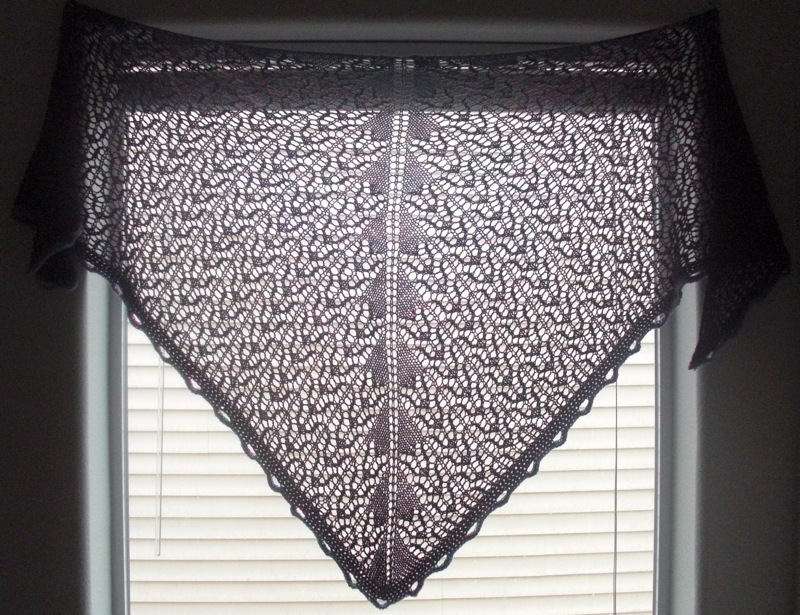 The pattern is beautifully written and this yarn is fantastically soft and smooth! 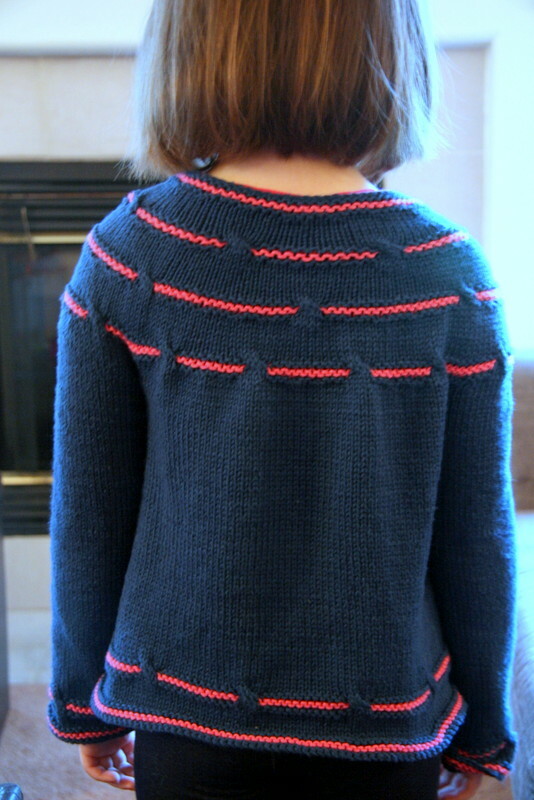 It’s been the perfect knitting project for while we watch AMC’s The Killing on Netflix. If you are still out there, please comment and let me know. Life has been full this past year. There were many projects cast on, but few finished. An amazing weekend at Sock Summit with my dear Chicago friends. Cori has gone from being a baby to a toddler and it’s been a joy to be home with her to watch her development. I look forward to what the year ahead will bring. -Strengthen my relationship with my amazing husband (having Cori has brought us closer together, but leaves us with so little time to be a couple. Feel free to leave any advice you may have). -Learn to play the guitar (I’ve always wanted to learn. My mom used to play folk songs for us when we were little and I hope to do the same for C). (So, will you be saying “two thousand ten” or “twenty-ten”)? I’m thinking it’s too pretty to leave at home so I will wear it out. I used Blue Moon Fiber Arts Socks that Rock Lightweight in Stonewash, Peaseblossom, Never on Sunday, Jubilation, & Lenore. More details on my Ravelry project page. 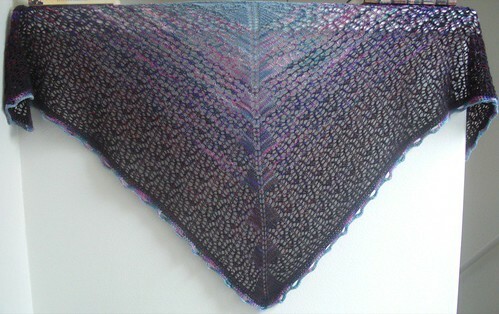 For years I had been considering knitting the Charlotte’s Web shawl, but never could commit. Then I saw Turtlegirl76’s at Sock Summit and I (as well as some of the Chicago Group) all suddenly had to knit it. After just a few days I’m already on the 3rd color. The pattern in the book Knits from a Painter’s Palette is not the easiest to follow, but with a little concentration I figured out what I needed to do. I’m usually a die hard chart knitter, but the chart in the book is frankly one of the hardest to read that I’ve ever seen so I’ve found following the written instructions for the 8 row repeat the best. I’m also using the chart provided by this blogger to keep track of rows and color changes (the excel file is on the right hand column of her blog). 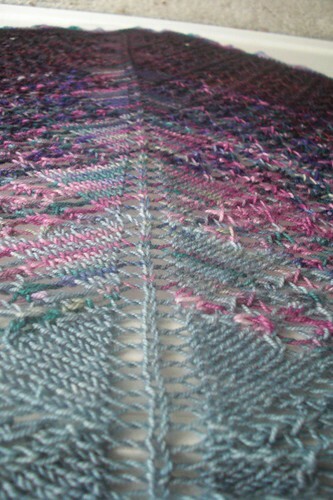 I’m knitting the shawl with Blue Moon Fiber Arts Socks that Rock in Lightweight. So far the colors I’ve used are Stonewash, Peaseblossom, and Never on Sunday. 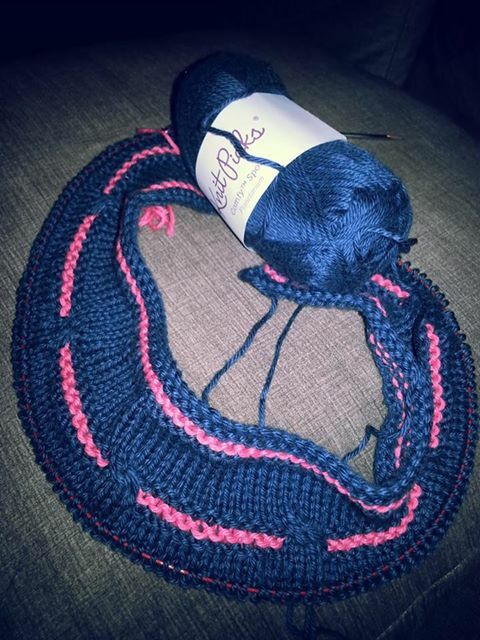 This project seems to move very quickly for lace as it’s so fun to see what the next set of colors will look like.